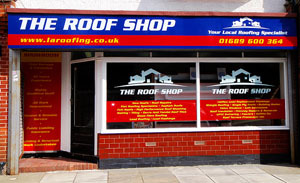 The Roof Shop, opening in May 2011. On display are a range of roof coverings, including high performance felts, asphalt and various types of tiles. Pop in for advice, to arrange a survey or estimate. New images added to the gallery, with more to come over the next few weeks. Project photo's so you will be able to follow the build from start to finish. Try our new enquiries form.